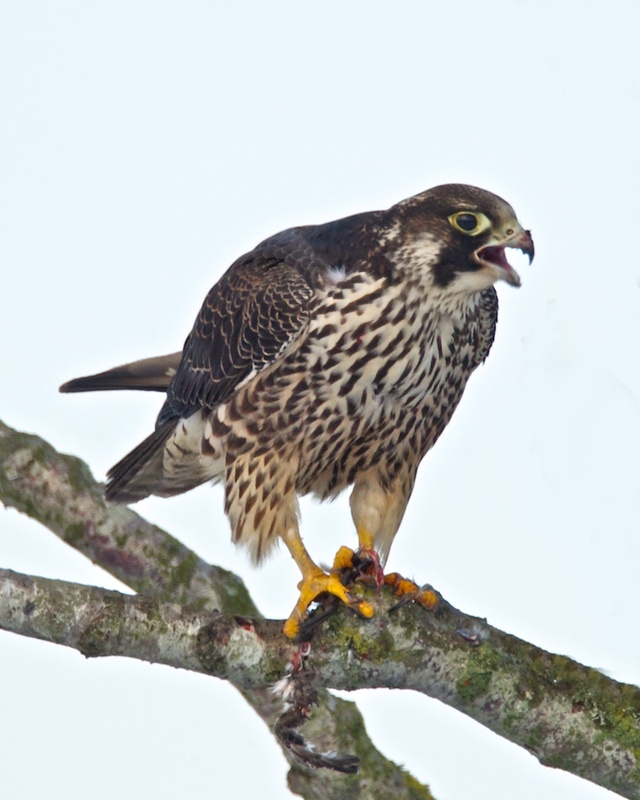 Tony Angell writes: "I was standing opposite a peregrine falcon's cliffside nest ... the female falcon, carrying prey, flew into a stand of madronas overhead. It was early ... and the hungry youngster had yet to be fed. Seeing the meal she had, the nestling responded with wing flapping and begging calls ... however, the young peregrine wasn't confident enough to fly out. ... There seemed to be a standoff until the adult began to pluck her catch." You can read more in Tony Angell's book, Puget Sound Through an Artist's Eye. 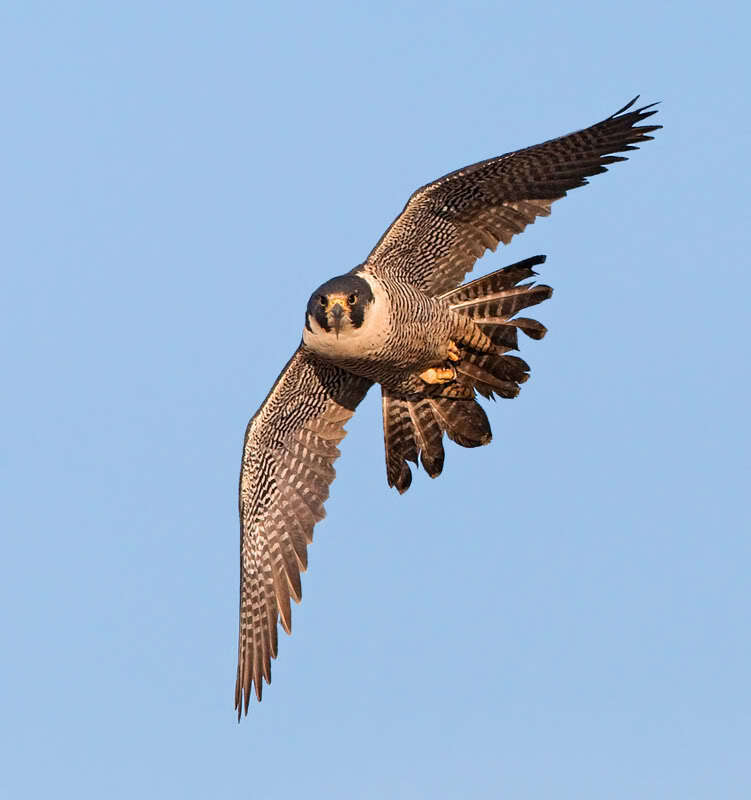 A few years ago, I was standing opposite a peregrine falcon’s cliff side nest…thinking optimistically of the bird’s continued recovery, when the female falcon, carrying prey, flew into a stand of madronas and cedars overhead. She called across the bay that separated her from the nest on the cliff face. It was early in the day, and the single hungry youngster had yet to be fed. Seeing the meal she had in tow, the nestling responded with vigorous wing flapping and begging calls from the narrow ledge. 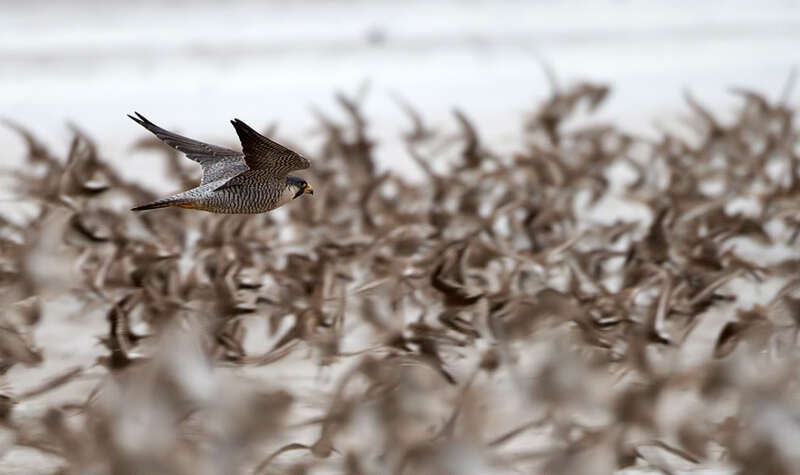 In spite of its hunger, however, the young peregrine wasn’t confident enough to fly out and cross the three-hundred-foot expanse of water that separated it from the parent. There seemed to be a standoff until the adult began to pluck her catch. Puffs of dark feathers floated out from the bank of trees and lifted towards me. This was enough to launch the young bird, and with choppy wing beats it gathered sufficient momentum to fly over to its mother and a meal. The begging cries continue and were interrupted only by the fledgling’s choking swallows as it bolted down one mouthful after another. That morning, band-tailed pigeon was on the menu. 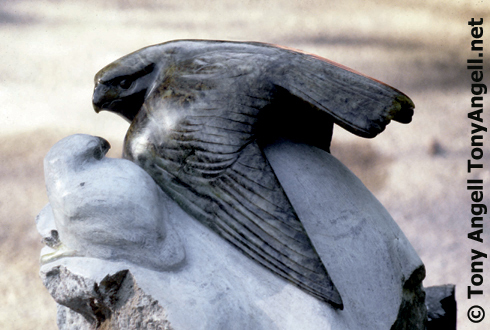 For a link to Tony Angell’s book, Puget Sound Through an Artist’s Eye, come to our website, birdnote.org. 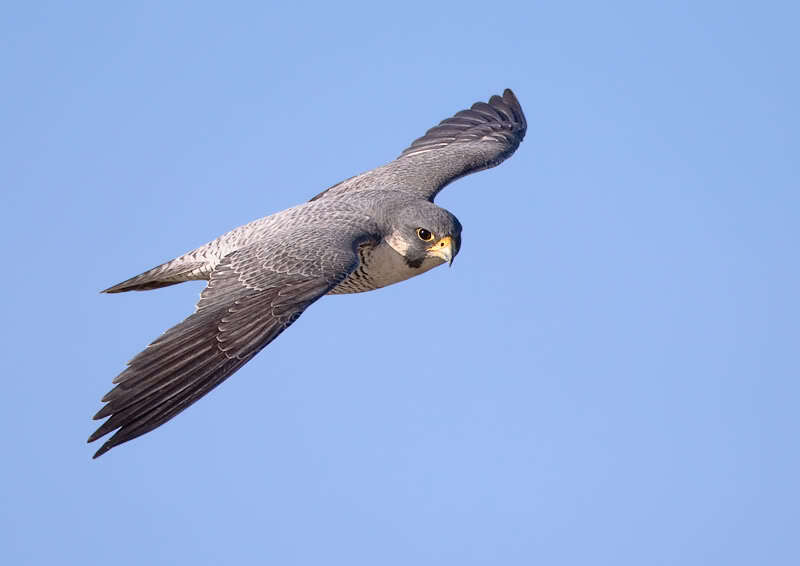 Calls of the Peregrine Falcon provided by The Macaulay Library at the Cornell Lab of Ornithology, Ithaca, New York. Begging call of a juvenile recorded by Andrea Priori; calls of the adult by Gerrit Vyn.